TRC #303: Earlobe Creases + Is Venus The Cat A Chimera? + Why Do Our Fingers Prune? Episode 303 of TRC is here. First, Pat takes a ‘frank’ look into whether earlobe creases are a sign of heart disease. Next, Adam purrrrrsues an answer to whether the beloved internet cat, Venus, is truly a chimera. Lastly, Elan dives hand first into the question of why our fingers prune in water. Is Venus The Cat A Chimera? Scientific American – Why Do Our Fingers and Toes Wrinkle During a Bath? This entry was posted in The Reality Check Episodes and tagged 303, cat, chimera, creases, earlobe, fingers, prune, trc, venus. Bookmark the permalink. 3 Responses to TRC #303: Earlobe Creases + Is Venus The Cat A Chimera? + Why Do Our Fingers Prune? Thanks for the episode, interesting as always. I was a bit unclear on one thing regarding Venus the Cat though, and that is: Is Chimeraism actually a possible explanation for it’s appearance or not? If it is I believe that the “unnecessary hypothesis” argument is the wrong way of looking at it and that it would be better to ask which of the two explanations is the likelier. 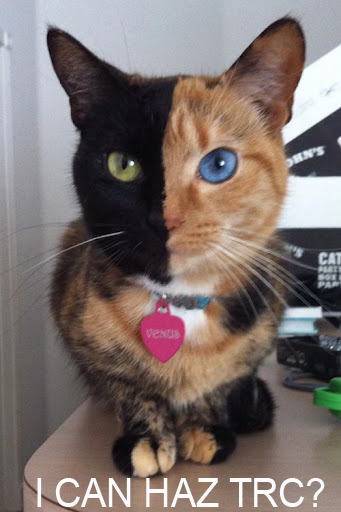 After all, it seems (to me who know nothing of cat genetics) that Venus having two different genetic syndromes that splits her left and right side in such a striking way may be just as unlikely as her being a chimera. Am I making any sense here? Chimerism is a possible explanation, but it’s absolutely unnecessary. It does not better a job of explaining this phenomenon than run of the mill tortoiseshell does. The separation down the middle is no more likely to be caused by chimerism. That is an unusual pattern either way. Chimerism doesn’t change how likely it is to be split like that. Because of that there is no reason to assume this cat is more likely to be a chimera than any other tortoiseshell. All that said, chimerism isn’t all that uncommon, so if Venus was tested, it may very well come up, but we don’t go around doing genetic testing on every female calico. It’s just not called for. Having thought about this a bit I still believe that your use of the term “unnecessary hypothesis” is incorrect. For chimerism to be an unnecessary hypothesis we would have to establish with confidence that Venus is indeed a tortoiseshell (and that tortoiseshellism can produce such a distinct split) and that she has a gene anomaly that gives her eyes different colours. Then there would be nothing left to explain and chimerism would indeed be unnecessary. However, you have only hypothesised that this is the likelier explanation, not given any concrete evidence.